The Kunsthal Rotterdam is one of the recognised icons of modern architecture. The building was designed in 1992 by the most famous architect in the Netherlands, Rem Koolhaas, as a Palais des Festivals, a meeting place for art and culture. The design launched his international career and is visited every year by many architecture lovers from all over the world. Together with landscape architect Yves Brunier, OMA is also responsible for the redesign of the Museumpark. Work has gone on with various parties in Rotterdam and elsewhere such as OMA/Rem Koolhaas and Urban Guides to enable the Kunsthal to play a full role as an architectural icon beside new icons such as the Market Hall, the Central Station and multifunctional De Rotterdam building. 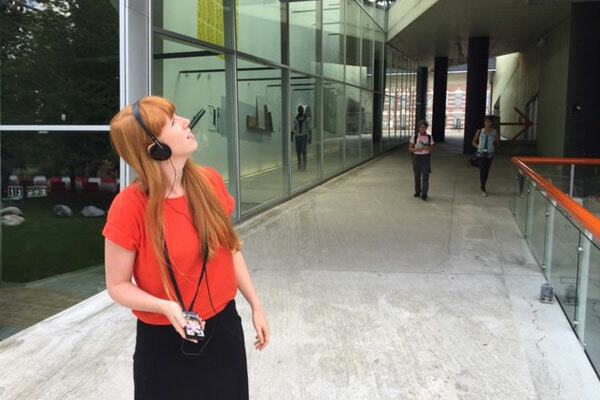 The architectural guided tours of the building and the adjacent Museumpark by Urban Guides, as well as the Listen Route with Mike Boddé that was launched in 2015, enable the public to find out more about the design of this remarkable park and the architecture of the Kunsthal. In the years ahead the Kunsthal will also organise multilingual publications, lectures and screenings to confirm the building as an architectural icon. 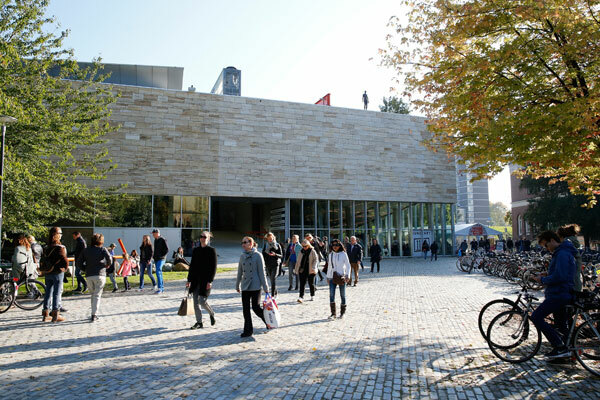 MIn 2015 the use of the building as a platform and meeting point once again enabled the Kunsthal to strengthen long-term relations with cultural partners, to reach a new public, and to develop a multidisciplinary programme that is just as multi-faceted and diverse as the exhibition programme. As a network location for businesses, associations and educational institutions, the Kunsthal also proved to be a wonderful source of inspiration for the exchange of information, for presentations and for informal meetings with one another. The result of the renovation supervised by OMA is a sustainable building with improved access and ease of running. The splendid Auditorium with a capacity of more than 300 is used by the Kunsthal to programme activities, but is also frequently hired separately as an event location. The number of receptions and events rose in 2015. 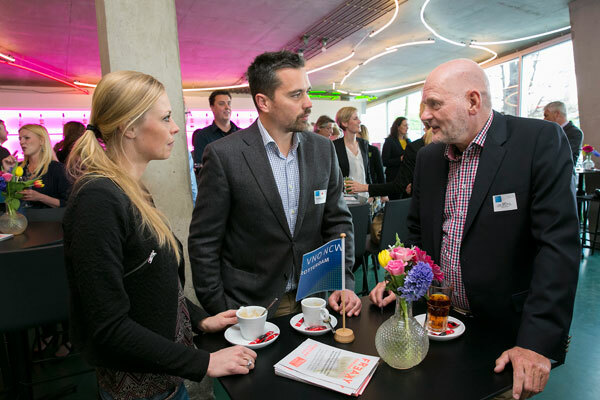 Parties such as Rotterdam Topsport, Rotterdam Partners and VNO-NCW have become regular guests by now, and well-known firms including various multinationals keep on finding their way to the Kunsthal. There were thirty business receptions during the Keith Haring exhibition alone. The Auditorium, in combination with the café and terrace, the shop and the reception area, is a well-tried concept and will continue to find favour in the years ahead. Many events constantly give the Kunsthal extra élan and contribute to livening up the Museumpark, such as the presentation of the VSB Poetry Award and the presentation of the architecture periodical OASE in the presence of Rem Koolhaas in a packed Auditorium. Temporary works of art such as the ‘Public Jukebox’ and ‘Bad News’ in a bunker opened to the public near the Kunsthal, both by Krištof Kintera and the billboard with a tropical sunset by Mathias Kessler add vibrancy to the surroundings of the building. Activities like the openings of exhibitions, family days and the Keith Haring Community Art Project also increase the influx of visitors to the park. In 2015 the Kunsthal worked together with the International Film Festival Rotterdam and Museum Boijmans Van Beuningen on the multidisciplinary event ‘Rotterdam Xpanded’ which will be held in and around the Museumpark in the summer of 2016. The Museumpark ticket, which was introduced as a pilot in 2012, has been such a success that it will be extended. There is regular contact with the marketing colleagues of the Museumpark institutions and, on the initiative of the Kunsthal, a Museumpark trailer has been jointly produced with Open Rotterdam. 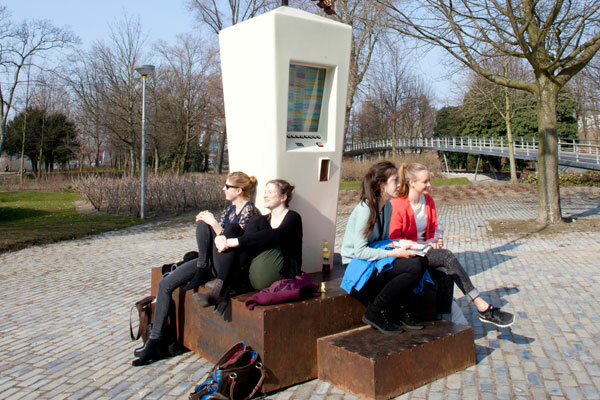 The Museumpark ticket is particularly popular with Dutch and foreign tourists who want to briefly enjoy the broad cultural range offered in the Museumpark. The Museumpark institutions have increased the print run of the ticket booklet and the number of sales locations in response to the increased interest in the city of Rotterdam from the Netherlands and abroad. Work is also going ahead on linking the Museumpark with Het Park (the Park Link) to connect the green spaces in the city with one another and to make it easier for pedestrians and cyclists to cross from one to the other. Instead of a steep staircase from the zebra crossing on the Westzeedijk, a gently sloping path has been introduced that is suitable for wheelchair users. The staircase next to the Kunsthal is less steep and the embankment and the square have been made greener. Work on the Westzeedijk master plan began in 2010, which is now being carried out in stages thanks to a European subsidy. The completion of stage 1 of the Park Link was celebrated on 19 May 2016. The completion of the Park Link will be a perfect moment for the Kunsthal to improve the appearance of its terrace. The renewed approach to place the management and maintenance of the Kunsthal with a Rotterdam consortium was described in detail in the 2014 annual report. A number of important alterations to the building have also taken place in 2015. Inside the Kunsthal, work has begun on improving the offices on the ground floor and the first floor, while outside a cycle facility for staff and visitors is being created. On 5 November 2015 the Rotterdam city council agreed to the construction of the Collection Building of Museum Boijmans Van Beuningen in the Museumpark. After this decision in favour of the Collection building by the city council, a route map has been drawn up to jointly find forms of more intensive cooperation in the Museumpark and various consultations have been held. In the past the Kunsthal has expressed its concern and raised questions regarding the arrival of the Collection building. With the arrival of the Collection building, the Kunsthal anticipates the real risk of displacement effects and a certain risk of a deterioration in physical accessibility. The Kunsthal will continue to keep a close eye on the plans for the Collection building next year.